TWS is pleased to announce that it is furthering its machinery range. 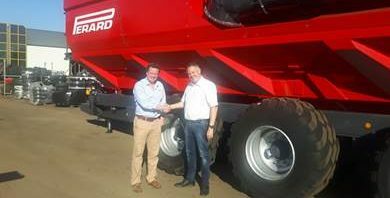 As well as being the UK importer for Veenhuis slurry equipment, it is now the importer for an exciting new range of material handling products from Perard. Perard equipment covers a range of chaser bins, field side transfer augers and conveyors together with muck spreaders. The Perard range furthers TWS’ capacity to deliver state of the art, forward thinking quality equipment. We shall be at the Cereals on stand no. 962, please come and see us.